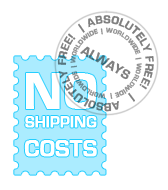 DustDeal.com offers free shipping on all products in the web shop (this excludes any import costs at customs). Orders are shipped in padded envelopes where possible and fit through the letterbox. You don't have to be home to accept the package. Products are sent from our two locations: the Netherlands and Guernsey. The average delivery time is 1 - 2 weeks. This way, you get quality products at a low price with perfect service! In some cases it's possible that duties must be paid. DustDeal.com can always offer support in handling this if you contact our help desk.